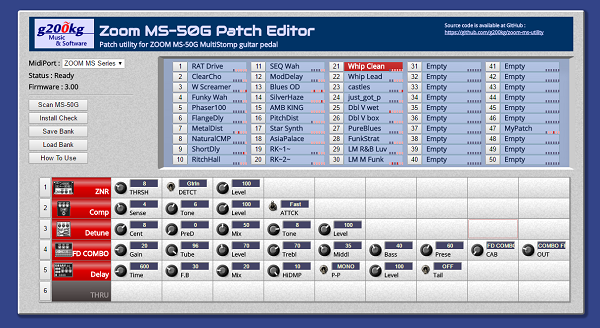 Web-based unofficial MS-50G patch editor. please try with latest Chrome. Just that was missing to manage the Zoom MS-50. Congratulations, you are the best in the world, thanks a lot ! 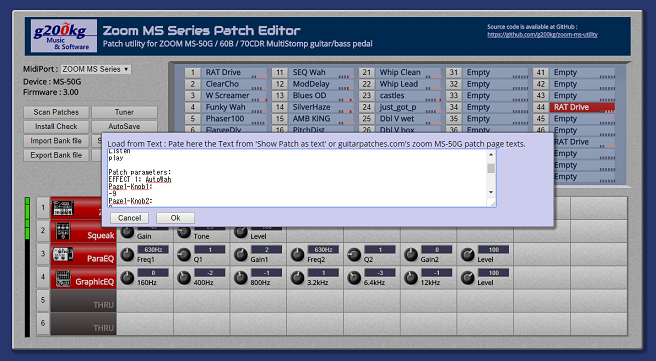 Now, tentatively support patch load from guitarpatches.com 's ZOOM MS-50G page format. 3) Paste to text input field. Yet many thanks g200kg for your job ! At the first thanks a lot again for your great application to manage the Zoom multistomp. I would suggest a new function that I think would be appreciated to everyone MS50/60/70-users. As you know, it's possible recall the presets on the basis of an alphbetic sequence (A, B, C, etc.). I would ask you if it's possible organize this sequence on the basis of a grafical interface. I downloaded to PC the files (github) in order to use it offline but I could not. Another Patch Editor is launched. This instance is no more effective. or the device is not connected. Online web page is working perfectly. I noticed you added some instructions for off line use. Thank you! Appreciate your work! Installed a local server (apache) but still not works. I tried also Opera, same error messages. I´m using only Linux (mint) environment on my laptop. What a great tool! Thank you!